Toward the goal of becoming a leader in digital technologies in Europe, Hungary is building its largest pavilion ever at the CeBIT conference, which starts in Hannover March 20, and CEU InnovationsLab company Talk-A-Bot will be one of the exhibitors as a successful innovative startup. 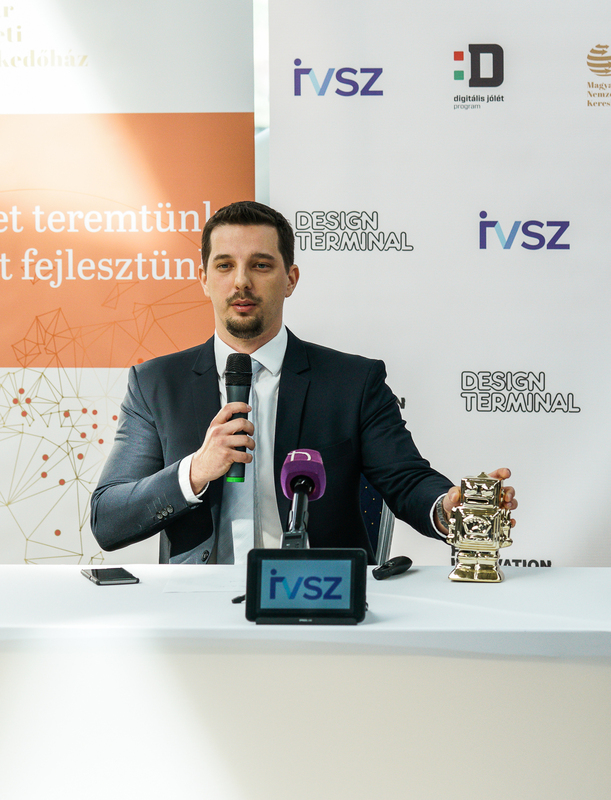 Talk-A-Bot represented the 18 Hungarian companies participating in CeBIT at a press conference held today by Hungarian government spokesperson Zoltan Kovacs and government project manager Tamas Deutsch. Talk-A-Bot enables companies to communicate with customers via social media with no human interface needed, answering questions and comments automatically and opening new marketing channels. Akos Deliaga and Gergely Kalydi, both graduates of CEU Business School, founded the company in 2016, and then developed it in and with CEU InnovationsLab. Hungary’s first chatbot agency quickly became one of the first partners of Viber. Today, more than 500,000 users communicate with the chatbots developed for Talk-A-Bot clients. Talk-A-Bot’s goal is to provide full service to its clients in addition to development – in which the bots’ personality, system integration, NLP programming, AI, big data management and marketing activities are also a part. During CeBIT, Talk-A-Bot’s “Cebiee” chatbot will help 200,000 visitors via Facebook Messenger at one of the world’s largest international digital exhibition. Cebiee will inform visitors about the Hungarian pavilion and provide other information about the expo. CEU InnovationsLab is the leading business school accelerator in the Central and Eastern European region. It leverages a new wave of entrepreneurialism at CEU as our talented, experienced and diverse body of students, alumni and faculty increasingly embrace innovation. At the InnovationsLab, venture teams work to translate great ideas into successful enterprises and also teach others how accomplish this throughout the globe. See http://business.ceu.edu/ceu-innovations-lab for more. CeBIT is one of the world’s largest international exhibitions on digital business, hosted in Hannover since 1970. The exhibition presents the biggest innovations and current trends in digital business. Visitors are decisionmakers from both business and the public sector. Hungary’s presence aims to attract investors to knowledge- and technology-intensive industries in Hungary, to help Hungarian digital businesses expand abroad, and contribute to German-Hungarian economic relations, the government said today in a statement. For more information see www.hungaryatcebit.com.